@Rohit, I am having the same issue. Have you found a fix for this yet? it's working fine on my server and I am not able to resolve it unless I can replicate the issue. Any ideas on how I can troubleshoot the issue? I went through the steps you outlined above but am still getting the error. App Not Setup: This app is still in development mode, and you don't have access to it. Switch to a registered test user or ask an app admin for permissions. @Rohit in order to add you as a test user on the facebook app it says we need to be friends or I need to know our username. Which facebook account is you? There are several Jazzi Singh. I searched for via your email address but said email not found. @Rohit done... you are added as a tester on my Facebook app. Guys, I was speaking to one of the facebook developer and he said that Cross-site request forgery validation failed error are due to url mismatch.. 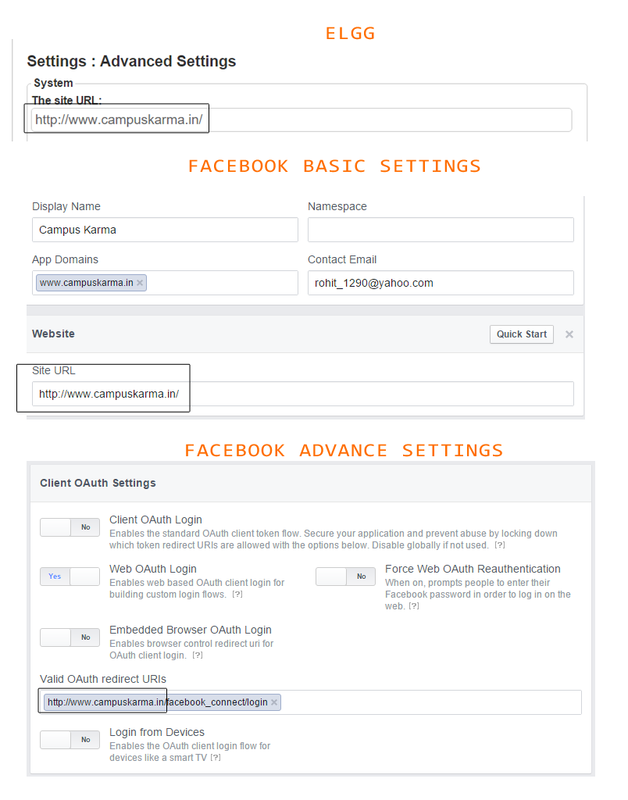 The website URL has to be same in the Facebook App Settings and in Elgg. if u have http://google.com in your elgg then same in the app settings. if u have http://www.google.com in your elgg then same in the app settings. if u have https://google.com in your elgg then same in the app settings. if u have https://www.google.com in your elgg then same in the app settings. Let me know if the problem still exist. @Rohit, still having the problem as mine was already set exactly like that. However I am using an IP address not a Fully Qualified Domain Name for this test server. Does it have to be a FQDN? No, I don't think using IP will be a problem. @Jojo123.. One more thing, I saw that you have enabled the "synced status on facebook for new users" option. Has facebook approved your publish_actions login permission? Would really like to get over this hurdle. Any other suggestions on how to resolve? Thanks!!! @Jojo123 - Can you try the new source code that I have updated in github. BTW, the error only appears after I activate it and goes away when I deactivate it. Luckily I was logged in on another browser it was easy to recover from. If anyone else tested this and got the same error, just delete it out of your /mod directory and you should be able to recover from it. Rohit let me know when you have another version you need me to test. Jojo123.. Can you look into your error log file and tell me what exactly was the error for Exception #1449957834? Ok.. I found the error.